The original and adapted screenplay categories are two of my favourites every year. This is traditionally where the Academy attempts to correct its worst Best Picture snubs, with many of my favourite movies of the last 20 years being nominated- or even winning- a writing Oscar despite having been ignored for the main prize. Whoever wins next Sunday will be in good company. Since I started watching 20 years ago, previous winners include screenplays for Pulp Fiction, Fargo, Eternal Sunshine of the Spotless Mind, Almost Famous, and American Beauty. These are some of my favourites of all time and I am happy to say that I think this yea’s nominees will make for another exciting race. Luc was probably right to predict a win for Birdman with Grand Budapest being possibly its only real competition. With Boyhood and Birdman being the clear Best Picture frontrunners though, I’d be a little surprised if neither one wins. And the unquestionable emotional impact of Boyhood is much more a credit to Richard Linklater as a director than it is to him as a writer. 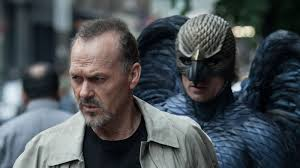 Like Luc, I predict a win for Birdman. And it really should win. The script is maddeningly layered as it often seems to be commenting on itself- poking fun at its cast and its critics. Besides, the dialogue has a rhythm to it that makes it a blast to listen to and would probably even make a really good read which to me is one of the best signs of a great script. That being said, Wes Anderson movies are always well-written and The Grand Budapest Hotel is no exception. It has a great rhythm too with humour at the most unexpected times that caught me completely off guard. Nightcrawler deserves honourable mention too finding a fresh take on the news media satire. Both funny and distrubing, writer Dan Gilroy gave Jake Gyllenhaal his best part so far and, neglected in other categories, I’m glad to see Nightcrawler get nominated for something. How many times have you heard “The movie was okay but the book was better”? It’s not easy to adapt “material previously produced or published” as we saw in 2003 nominee Adaptation. More often than not, I find the pickings to be slimmer among the Adapted Screenplays than the Original ones. This year especially. I finally watched American Sniper last night and found it seemed to lack focus. What it was “about” seemed to change several times as the movie went on and any scene taking place before Kyle’s first tour was completely unnecessary and disrupted the flow of the film. I’m glad the two-hour-plus bad trip that was Inherent Vice was nominated for something and the great Paul Thomas Anderson did Thomas Pynchon’s hippie noir the justice it deserved. Anderson has made better movies than this though and, since Inherent Vice was marketed as a comedy, he would have been wise to let us in on the joke just a little bit more. Director James Marsh gave us more poetry in the images in The Theory of Everything than writer Anthony McCarten did in the screenplay. The movie worked very well and everyone involved deserves some credit for that but the cinematography and acting by the two leads are probably the main reason we’re even discussing The Theory of Everything at all during awards season. The Imitation Game, on the other hand, is extremely well-written. Mathematicians breaking codes can be a tough sell for a night at the movies but writer Graham Moore helped make this a crowd-pleaser, what Jay called “The Avengers for math nerds”. Still, Moore’s screenplay relies on a few cliches too many, particularly frustrating in a film that is for the most part so well-written. That leaves Whiplash. Damien Chazelle’s script wouldn’t even be in the top 3 if it would have to compete with the nominees in the Original Screenplay category but it is a clear winner here. 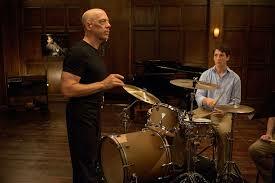 The psychology of both teachers and musicians is insightful and, better yet, Chazelle has written a part for the underrated J. K. Simmons that has virtually guaranteed him an Oscar. Whiplash is probably going to be remembered for Simmons’ performance but it’s an all-around good movie and, if justice is served, it should win the Oscar for Best Adapted Screenplay. This entry was posted in Rants, Raves and Righteousness and tagged Oscar contender on February 13, 2015 by Matt. Excellent review! I am looking forward to reading your entries in the lead up to the Oscars.